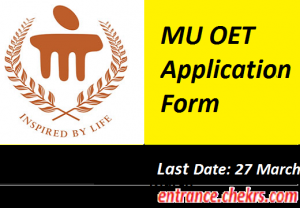 MU OET Application Form 2017: We are here to inform the candidates who are looking to apply for MU online entrance test 2017, that the application submission deadline is about to come, so they all are advised to advised to register themselves by submitting their MU OET 2017 Application Form on before 27th March 2017 by following the procedure given above. Only the candidates meeting the eligibility norms in all the aspects are invited for MU OET 2017 Online Registration. All the interested applicant have to submit the online registration form on the compulsory basis for participating in the MU online entrance exam. After the successful application submission, selected candidates will be invited to appear in the MU Online Entrance Exam 2017 on 24th April to 17th May 2017. Applicants have to click on Manipal University portal, i.e. manipal.edu/. Now do registration and generated Username and Password. Log in and click on application form link. Upload all the asking document scan copy with the application from. Pay application form fee through the appropriate mode of payment. Submit the MU OET Application Form and do not forget to take application form copy. The applicant can check their application form status by entering the Username and password. After the successful submission of the MU OET Application Form 2017, the applicant can start preparing for the examination in a perfect approach. The Manipal University has its campus at Manipal, Sikkim, and Jaipur. The University conducts online entrance test for admitting the willing and deserving candidates into its undergraduate classroom engineering programs. Only the eligible applicant who has passed the class 12th exam with PCM will be able to apply by submitting the MU OET Online Application Form 2017 between the dates 01st November to 27th March 2017. All the interested candidate can apply for exam application form after fulfills the eligibility criteria. MU Online Entrance Exam 2017 will be conducted on 24th April to 15th May 2017 for I & II attempt and on 17th May for IIIrd attempt. For any type of assistance, while registering for MU Online Entrance Test 2017, you can contact us by leaving your views at the end of the post.